Lisbeth Firmin will exhibit for the second time since moving upstate in 2000 at the MURAL Gallery in Hobart NY. 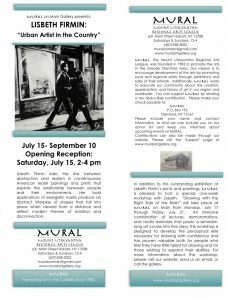 The exhibit will feature paintings and prints, and will open with a reception on Saturday, July 15 from 2 to 4pm. In addition to this outstanding exhibition of Lisbeth Firmin’s prints and paintings, MURAL is pleased to host a special, one-week workshop with Lisbeth. “Drawing with the Right Side of the Brain” will take place at MURAL on Main from Monday, July 17 through Friday, July 21. An intensive combination of lectures, demonstrations, and studio exercises that packs a semester- long art course into five days, this workshop is designed to develop the perceptual skills necessary for drawing with confidence and has proven valuable both for people who feel they have little talent for drawing and for those wishing to expand their abilities. For more information about this workshop, please visit our website, send us an email, or call the gallery.